Today’s defence-related news includes reporting on a new £1 billion deal to support Royal Navy operations, coverage of Exercise Saif Sareea, and a story by the Mail On Sunday that incorrectly suggests ex-service personnel are being approached to return to active duty and offered financial incentives. The Mail on Sunday incorrectly suggests that Ministry of Defence representatives are approaching former serving personnel and offering them one-off payments and a return to active duty at the same rank they achieved before they left. Neither the Army, nor its recruiting partner Capita, have written to individuals to invite them to re-join the Armed Forces. The Army's full statement was not carried in the story. “We have always welcomed applications from individuals whose circumstances have changed since their time of leaving the Army. “Those re-applying must meet our high standards in order to re-join the Army and all applications are considered on a case by case basis. 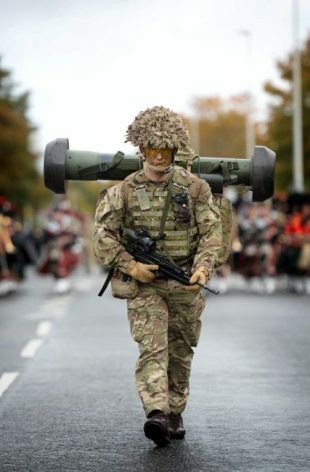 The Royal Highland Fusiliers, 2nd Battalion The Royal Regiment of Scotland, parade through Penicuik, Scotland after their Iraq tour.